Termite Symbiotic Protists & Prokaryotes – Stage one study. This first study describes the protist symbionts in two termite species, Coptotermes frenchi and Coptotermes acmaciformis, from two locations in the Watts Gully area of the Adelaide Hills, South Australia during late 2013 and early 2014. 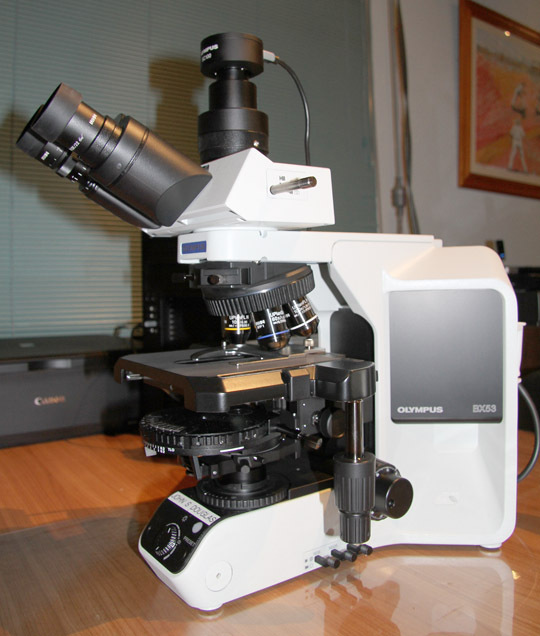 The author used an Olympus BX 53 Differential Interference Contrast microscope to observe and record images. The association of spirochaete bacteria with their protist hosts is discussed, including possible links with Quorum Sensing. The role of termites in producing significant greenhouse gases and their potential for bio-fuel production is discussed. All termites eat wood, yet cannot digest it. Termites rely upon a regime of symbiotic gut protists and prokaryote bacteria to digest the wood. Without them the host will die, without the termite, they die. For at least 250 million years the symbionts within the termite gut have evolved along with their termite hosts. Termites are an ancient and remarkable group of insects which occupy a special niche in nature. Their symbiotic association with protists and prokaryotes is one of the most sophisticated and interesting associations in nature. The origin of this association is the subject of intense genomic research. The so called “Upper Termites” have only prokaryotes and the “Lower Termites” both eukaryotes and prokaryotes. Why this is so is not clear. Along with some cockroaches, termites are among only a small number of wood eating insects with protist symbionts. Termites cause billions of dollars of damage to structures and crops globally, and we spend more billions to protect our homes from their activities. Molecular biology holds the promise of new ways of preventing termite damage and utilization of their protist and prokaryote symbionts to produce future bio-fuels. An integrated protocol for termite protist taxonomy is discussed. 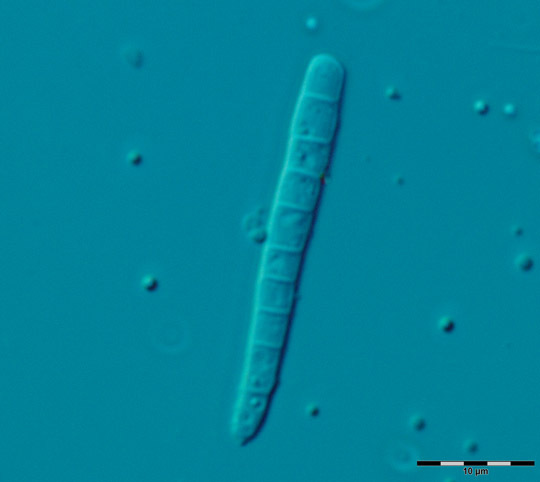 Possible new species are presented and thirty two protist and prokaryote images presented. Protist, prokaryote, axostyle, flagella, Differential Interference Contrast (DIC), protcol for taxa, quorum sensing, greenhouse gases Oxymonadida, Parabasalia, Trichomonadida, Hypermastigida, Polymastigida, Spirochaete, Bacillus, Streptobacilla, Treponema, Cocci-Bacillus, Cthulhu. 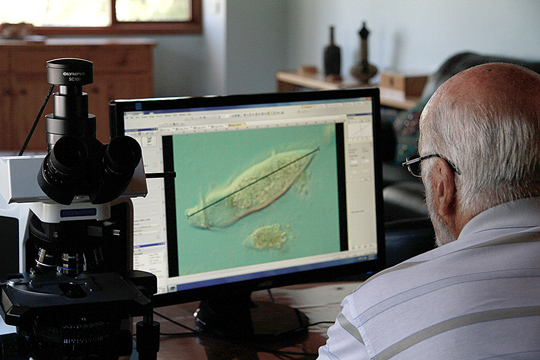 To carry out a study of the protists in termites in the Adelaide Hills Region. In the first case to image and record the varieties of symbiotic protists and prokaryotes found in the gut of termites from two specific sites. To develop techniques using Differential Interference Contrast microscopy and communicate with other protistologists in this field. 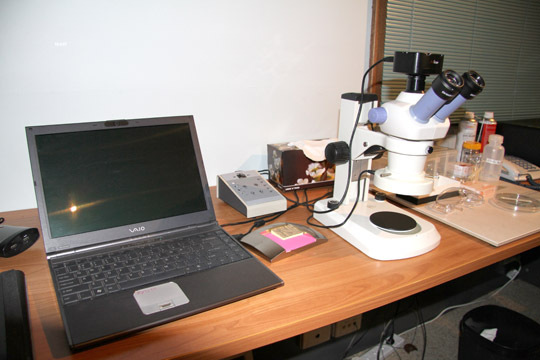 Further studies will attempt to categorise the many other images recorded (to date over 500) of the protists to the species level, and continue the author’s studies of the termite protists and prokaryotes from these and other sites. After extensive surveys of the region two specific nests (Sites 1&2) in the Watts Gully area of the Adelaide hills were been selected as reference sites for termites in this first study. 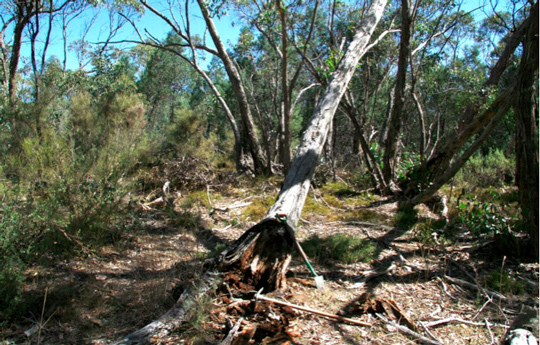 Both sites are in mature Eucalyptus open woodland. Many other sites in the area were found to contain “upper” termites which contain no protists. The general site is located at 34° 45’ 3” S and 138°55’ 30” E at an altitude of 394 m. The termites from site 2 were considerably larger than those from site 1. Protists and prokaryotes from termites from sites 1 & 2 are designated as group 1 & 2. 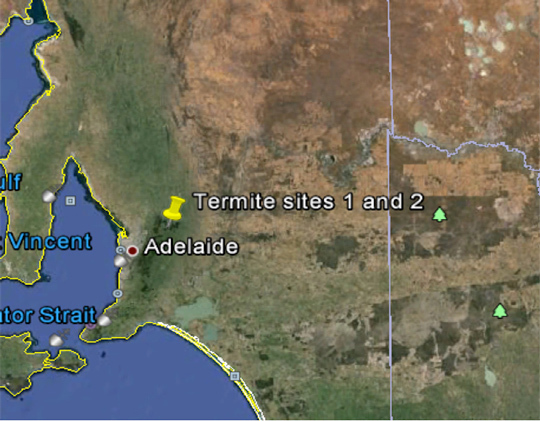 Although close to each (50m) the two dead eucalypt trees contained two distinct termite species.The author believes that site 1 termites are Coptotermes frenchi and site 2 termites are Coptotermes acmaciformis. Termites were extracted by digging into the bases of two dead and dry eucalyptus tree stumps (plates 4 & 6), both at and below ground level. Once collected the termites are housed in plastic tubs of approximately 100 x40mm with wood and debris from the site. Distilled water was added from time to time to maintain humidity. The location of and photographs of the sites are shown in plates 1-5. The termites have thrived for several months. PLATE 1: Google satellite image showing overall location of sites 1 and 2. Termites are small, soft-bodied, social insects that feed on wood, grass, dead leaves, bark, humus, fungi or the dung of herbivores. They are commonly known as white ants, but are not related to true ants. There are over 2300 species of termites of which about 350 occur in Australia, and of these about 12 damage sound timber. Termites also recycle organic materials and aerate the soil. They are an important part in the diet of other animals and their activities provide hollow logs, which are used by birds and mammals. Traditional Aboriginal people use termites to hollow out selected logs for musical instruments called Didgeridoos. The following species do the most economic damage in Australia: Coptotermes acinaciformis, Coptotermes raffrayi, Coptotermes michaelseni, Mastotermes darwiniensis, Nasutitermes exitiosus and Schedorhinotermes reticulatus. Unfortunately the author could find no termite taxonomists in Australia, apparently the last one left for a position in Singapore. The author has preserved specimens from each group used for microscopy in 95% ethyl alcohol for later identification. The author has made investigations which conclude that site 1 termites are Coptotermes frenchi and site 2 are Coptotermes acmaciformis. Individual termites, both workers and soldiers are positioned under a binocular dissecting microscope on a cavity microscope slide in a drop of 0.6% NaCl. The termite is decapitated, the abdomen carefully teased apart, and the gut contents viewed. 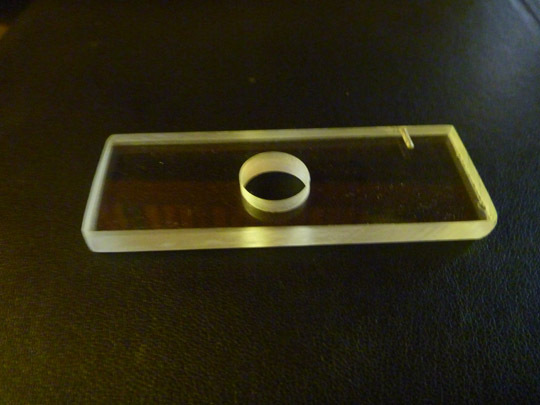 The contents were placed onto a slide and covered with a precision 0.17mm coverslip. 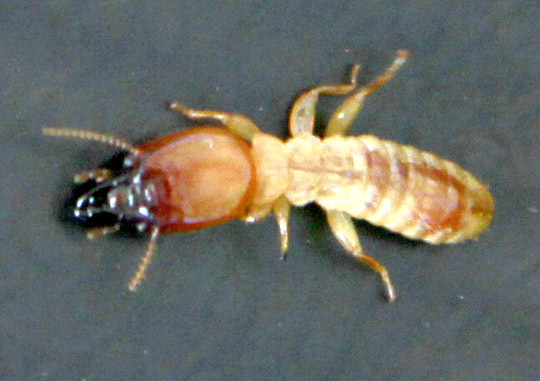 A termite from the same group is preserved in 95% Ethyl Alcohol for later identification. After communication with Dr Erick R. James of UBC, Vancouver the author has moved to use 0.45% NaCl and also prepare Tragers U media. PLATE 2: Stereo microscope used for termite dissection. 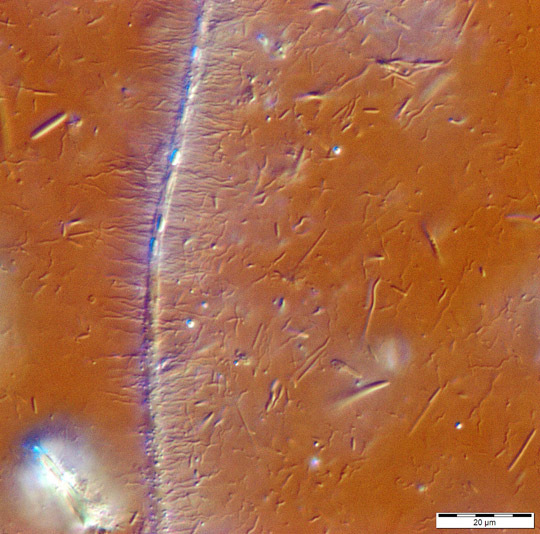 The slide specimens were observed using an Olympus BX 53 Differential Interference Contrast research microscope, images were recorded with an Olympus SC100 digital colour camera and processed using Olympus Dimension software version 1.9. PLATE 3: The Olympus BX 53 DIC microscope used in this study, including a UplanSAPO 1.4 oil objective, courtesy of Olympus. PLATE 4: Site 1 – Dead Eucalyptus tree, termites were collected from the base in solid wood. PLATE 5: Worker termites from site 1. 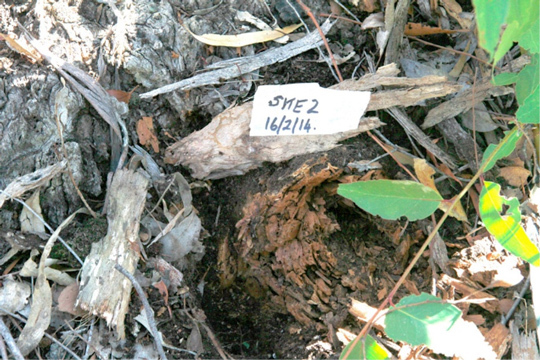 PLATE 6: Site 2 – Base of long dead Eucalyptus tree, only the base at ground level survives as a home for the termites. PLATE 7: Soldier from site 2. PLATE 8: Worker from site 2. Termite protists are a diverse group of obligate endo-symbionts living in the gut of termites. They range from very small flagellates and amoeboids to very large flagellates. To date, the author is unaware of any cilliates recorded from termites. Unsurprisingly termite protist taxonomy is a work in progress. The author chooses to use the system in the “The Society of Protozoologists (2000) The Illustrated Guide to the Protozoa Volumes 1 and 2″, until something better comes along. 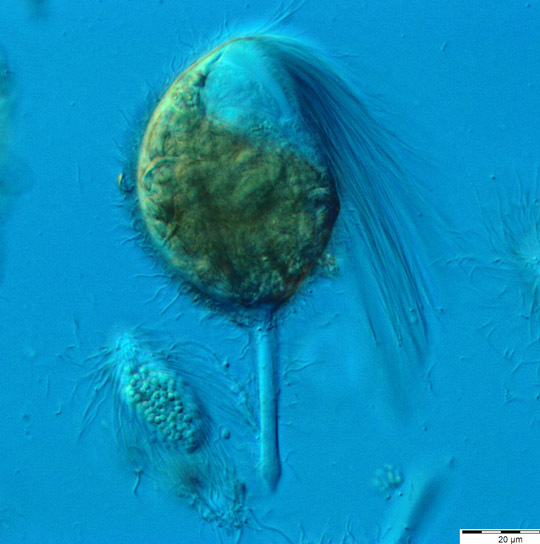 The image gallery includes protists from the following taxa. 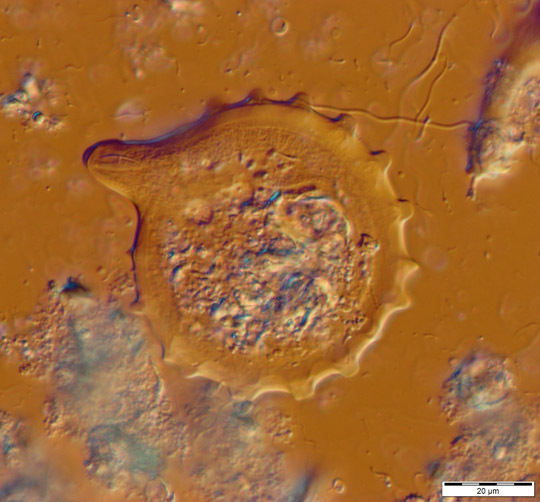 Amoeboid Protist: Possible Mastigella sp. a symbiotic methanogen reference – van Bruggen et al 1985) or Vahlkampfia, (Kudo fifth ed 1971). As stated above the taxonomy of termite protists is in flux, as it has been since the days of Harold Kirby in the 1930’s. For any investigator this is a major problem as many texts use differing nomenclature. Line diagrams are composites of many observations, and may, or may not, look anything like the live specimen under observation. In living termites protist species are often variable and morphologies vary widely and may overlap. Many descriptions are of dead, and/or, fixed specimens, which may not relate to living specimens. The development of a protocol for techniques such as DIC imaging would go a long way to resolve these issues. The author’s experience in the field of remote sensing illustrates this, where imagery analysis and intelligence is based upon strict protocols and platforms to ensure consistent target identification. An important step could be the development of a computer based platform which synthesizes the imagery and data from light microscopy, EM, SEM and sRNA genomic into a robust and forensic set of templates. The author is interested in developing this with the help of like minded protistologists and computer experts. Many more species have been imaged and will be posted as processed in subsequent upgrades. New images will also be posted as they are processed. This study has revealed a rich association of prokaryote bacteria in both the upper and lower termites. The upper termites contain only prokaryote bacteria. Whilst the protists have been extensively studied for over a century, little work has been carried out on the bacteria. These bacteria play an active and important role in the gut ecology and biochemistry of termites, many are methanogenic. Endobionts who reside as symbionts within the protist protoplasm, their function is even more obscure. Termite protists and bacteria predate their equivalents in the ruminant mammals and bovines by hundreds of millions of years, and are more efficient in converting cellulose and lignin into energy. 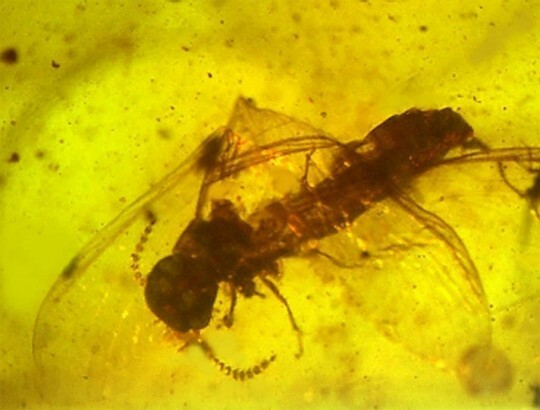 There are a number of examples of fossil termites in amber, some have even extruded recognisable protists,the earliest termite protist appears to be in the order of 250 million years BP. The question arises, is there an evolutionary link with termite protists and prokaryotes and the ancestors of mammalian ruminant protists and prokaryotes? PLATE 9: 100 million year old termite in amber. To the authors knowledge there are no recent studies of termite protists and prokaryotes in South Australia. There has been little bio-genetic research done on Australian termite symbionts in general, or their evolutionary biology. This is an area that requires attention, in particular sRNA and ribosomal RNA analysis to establish taxonomic links, possible evolutionary pathways and biogeographic distribution patterns. The author is seeking co-operation with a number of researches in this field. Termites and their symbionts are significant contributors to global greenhouse gases. Termites chew wood, humus and vegetation, essentially cellulose and lignin into tiny bits. In their gut their symbionts obligingly produce enzymes to reduce the indigestible material into food for both host and symbionts. The protists and prokaryotes produce a number of by-products, namely acetate, utilised by the host for energy along with CO², Methane and Hydrogen. CO² and Methane are so-called “Green House Gases” and any contribution to global green house gases must be taken seriously. Human C0² input, including industry, automobiles and agriculture, produce about 37 billion tonnes of C0² annually. Termites are reported to produce a large amount of CO², with estimates ranging from 1.5 -50 billion tonnes. A detailed paper by Sanderson (ref 9), concludes that termites produce 19.7 million tonnes/yr of methane and 3.5 billion tonnes/ year of Carbon Dioxide, both significant inputs. As the production of these gases by termites is linked to temperature, thus more gas in the tropics. Termite gas production may be linked to climate change, this is an area requiring more definitive studies. What is the impact of termites on climate forcing, and what is the biogenic cycle of termite gases? As any builder knows, wood is one of nature’s best composites. They also well know the threat that termites pose to our structures, not just wood, including concrete, plastics and many other modern products. Over millions of years termites, and their symbionts, have developed an incredibly efficient chemical process to convert cellulose, lignin into a food, this process is both complex and exquisite as seen in Fig 1. Fig 1: Upper and Lower termite Biosynthesis models. (From Trends in Microbiology). Termites destroy buildings and crops, the combined cost is several billion dollars annually. Protection of buildings and crops also consumes billions of dollars. Toxic pesticides are no longer acceptable in many countries, and other newer environmentally acceptable methods are less effective. What is required is a different approach, a biochemical and molecular approach. Termites must quickly ingest from fellow termite excreta a new fauna of symbionts – or die. The author suggests that there is considerable potential to find biological controls for termites, including utilizing quorum sensing to develop biochemical mechanisms to inhibit the attachment of spirochetes to the protists. Termites and their symbionts produce several gases which are of significant potential commercial value, namely CO², H² and CH4. A number of researchers and companies are actively engaged in utilizing the ability of termites to produce these valuable gases, and concomitant bio-fuels. Unfortunately the symbionts are not easy to cultivate outside the termite gut which has a particular set of environmental parameters. To the author’s knowledge no commercial termite cultures are presently active. Testing skills using a new microscope and software, and developing techniques to keep the protists alive on a slide for at least 15 minutes. 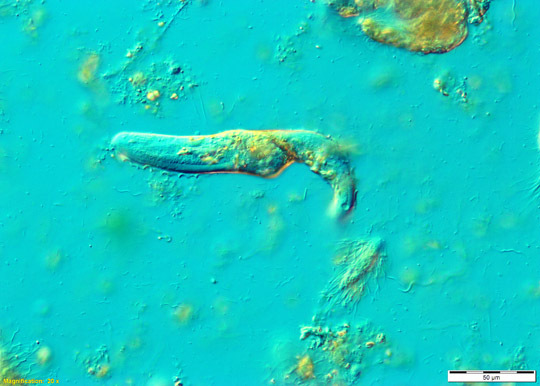 To date the author has been unable classify a number of protists imaged. This is a work in progress and updates will be posted. I look forward to advice from, and working with, others with expertise in termite protists and prokaryotes. Recent communication with Eric James of University of British Columbia, Vancouver has suggested 0.45 NaCl and Traeger U solution,(ref 6 & 7). Recently, 4th April 2014 the 0.45 NaCl has been used and appeared to be a more successful media.successfully used. 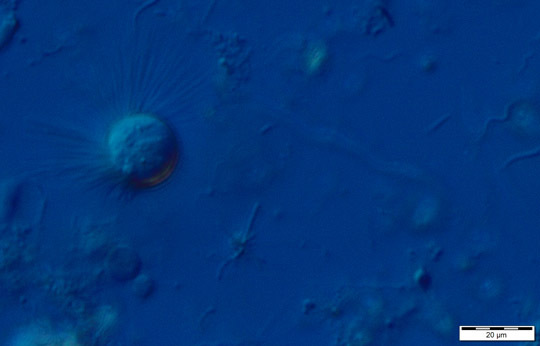 Take multiple images quickly and review after 5-10 min, after which the protists often begin to change shape, rupture or die. The Prokaryotes are more robust and often continue active movement for up to an hour or so. 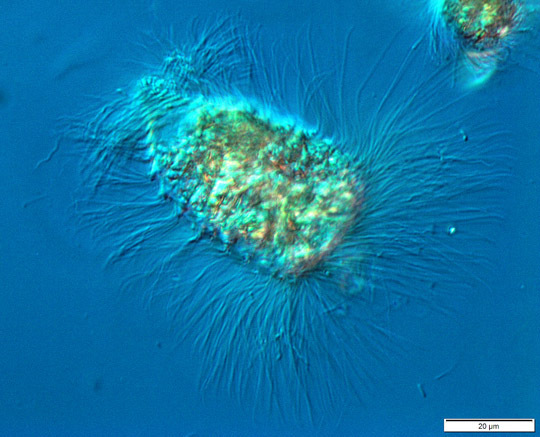 Different protists appear to survive longer, the author is presently documenting this. Following correspondence with Erick James regarding well-cell slides of brass, the author produced several using acrylic. This is a very quick and easy method to cut and drill, acrylic is cheap and comes in a wide range of thicknesses and colours, including black and white. The technique is to adhere a coverslip to the underside with Vaseline. Then using micro-pipettes collect protists for further observation. The author uses 1ml commercial disposable pipettes, using a low flame Bunsen draw the plastic out and cut. These pipettes are less than a cent each, soft and do not damaging the protists, far better than glass. PLATE 10: Acrylic well slide. I have adopted the classification system of “The Illustrated Guide to the Protozoa” volumes 1 and 2, second edition 2000, published by the Society of Protozoologists, Kansas USA, and Allen Press. All images were taken with an Olympus BX 53 upright microscope with Differential Interference Contrast, an Olympus SC 100 10.3 MP digital camera, processed using “Olympus Dimension” 1.9 software and recorded on redundant hard drives as Tiff Files. All images have an imbedded scale in microns, detailed meta-data files are recorded in “Dimension” for future reference. Unless otherwise stated, images have not been enhanced other than basic brightness and contrast. Video images are recorded using “Dimension” and stored in “Dimension” as AVI files. The authors web site will include high resolution videos once a format is selected. 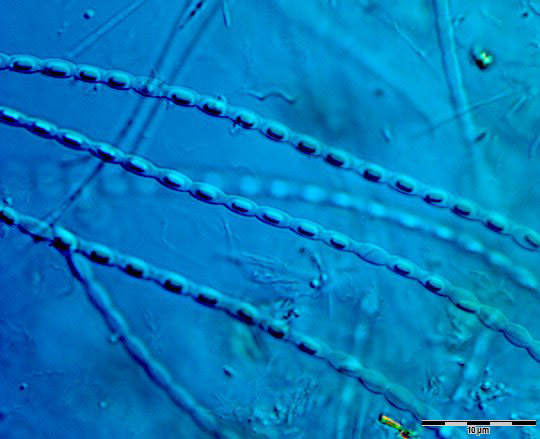 This study has revealed a complex and diverse group of termite gut protists and prokaryotes from only two sites in the eucalyptus woodland of the Mt Crawford /Warren District of the Adelaide Hills. Due to the lack of termite taxonomists in Australia the author has attempted to classify the two groups.Termites were preserved in 95% Ethyl Alcohol for future identification. 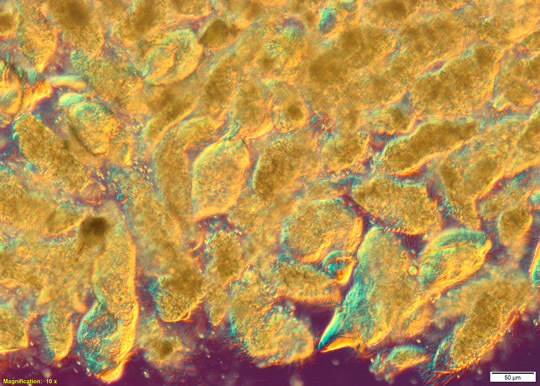 Differential Interference Contrast microscopy is ideally suited to imaging the gross and the detailed anatomy of the protists and prokaryotes. An extensive image library (over 1000 images) were recorded along with detailed meta-data, which are available to researchers upon request. 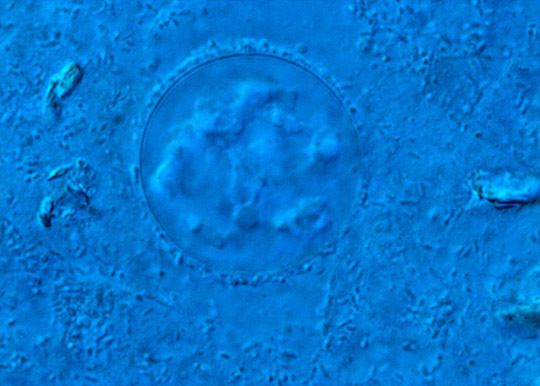 The detailed relationship between the protist and their attached spirochaetes is the subject of further study by the author. The observation of the natural behaviour of these protists is difficult over extended time outside of the anaerobic termite gut. To date I have no knowledge of the successful culture of Australian termite protists. The author’s studies of termite protists and prokaryotes is ongoing. All images, figures, diagrams and text in this article and www.protozoa.com.au are unless otherwise cited, copyrighted and remain the exclusive property of JD² Pty. Ltd. That said, these images are available as full resolution tiff or jpg files with meta-data upon request to john@protozoa.com.au at no cost to bonafide researchers, with the condition that they are not used for any commercial use or profit, and will be acknowledged as sourced from John S. Douglas at www.protozoa.com.au. I would also appreciate receiving a copy and/or reference to any such use. Any commercial use will require a specific written or email request. Olympus Australia – Adelaide Office: Michael Hughes, Craig Noble and Kim Everuss, who have provided outstanding and continuing support. They made my purchase and introduction to the extensive capabilities of the BX53 with DIC and “Dimension” Software, a pleasure rather than a pain. B TP: A leading design company in Melbourne, for design of and support for my web site. Dr David Patterson: Of Woods Hole USA, for support and advice on Protistology. The Society of Protozoologists (2000). The Illustrated Guide to the Protozoa Volumes 1 and 2. Kudo Richard R. (1977 3rd Printing) Protozoology. Klaus Hausmann, (2003) Norbert Hulsmann, Renate Radek. Protistology. Jahn T.L, Bovee E.C. and Jahn F.F. (1949) How to Know the Protozoa. Mackinnon D.L. and Hawes R.S.J. (1961) An Introduction to the Study of Protozoa. Erick R. James, personal communications by email April 2nd etc 2014. Sanderson, M.G. Global Biogeochemical Cycles, Vol 10. No4. Pages 543-557, December 1996. Possible new species in Australian termites imaged by the author in group 2 termites, Coptotermes acmaciformis, small protists like these have recently been described by Erick R. James ( see ref 6) are shown in image C.
Erick James protists lack the “Bulb” in the axostyle seen in these image, the question arises: is the bulb an artifact or real? Many images have recorded the same bulb, often after only a minute after removal from the termite gut. Following communication with Erick James the author has carried out further investigations using 0.45 Na Cl solutions and rapid images, that is within several minutes of disection. New images from 5th April are attached showing the bulb (Images D & E). IMAGE A: Possible unrecorded Cthulhu species in Australia. These two images are from group 2 termites. The author has noted these small flagellated protists are common in both group 1 and 2 termites. As can be seen they differ from the type in Erick James paper by having a bulbus inclusion two thirds down the axostyle, the flagella are easily observed along with cytoplasm inclusions. They are quite active and the flagella “jerk” the body around. Olympus UplanSAPO 1.4 x100 oil immersion objective in both images. 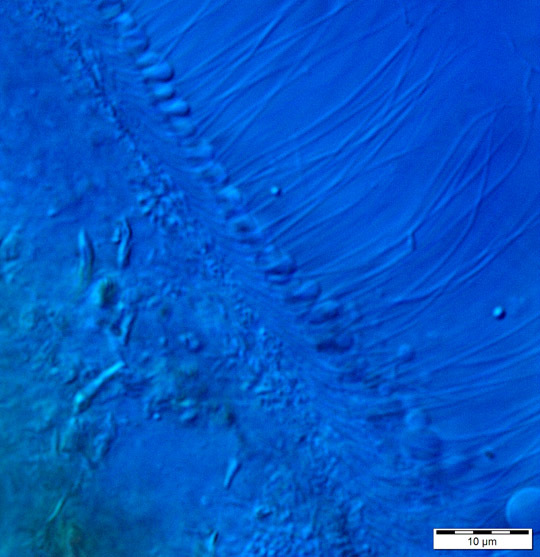 IMAGE C: Two images of Cthulhu Macrofasciculumque from E.James et al (reference 6). IMAGE D: New image using 0.45% NaCl and group 2 termites, image taken on 5/4/14 with x60 NA 0.95 dry UplanFLN objective, note bulb which is a possible artifact. 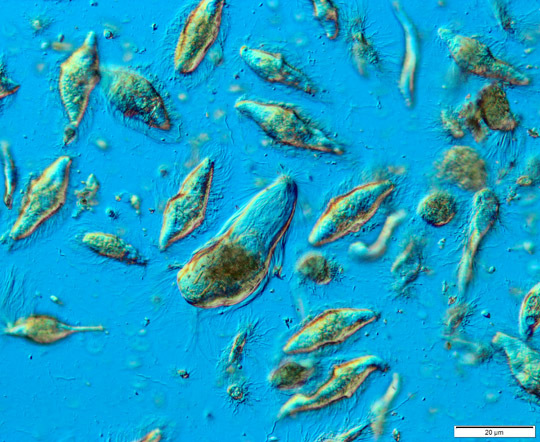 IMAGE 1: Low power view of dense population protists dominated by Trichonympha campanula in termite gut. 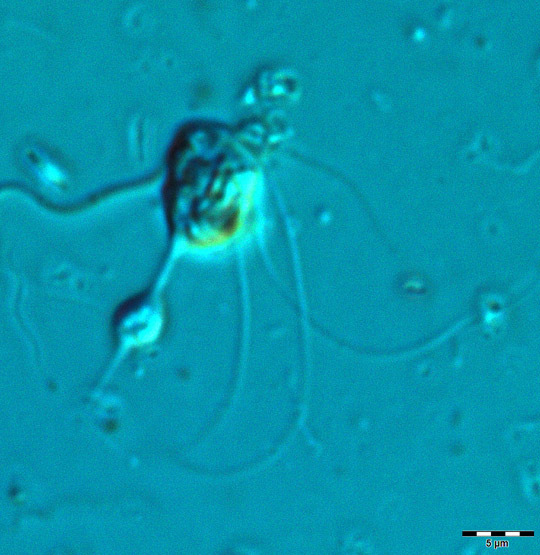 IMAGE 3: Pseudotrichonympha sp. 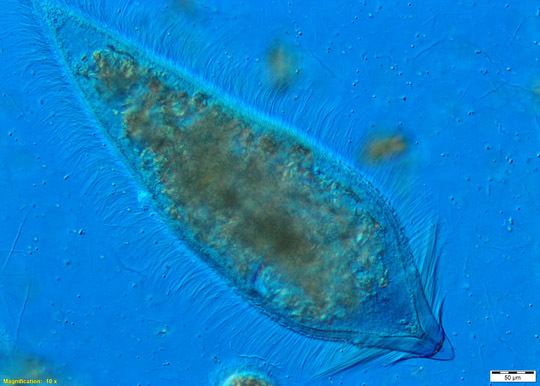 Note the anterior long flagellae which are used to steer the protist, and the body covered with symbiotic spirochaetes and bacilli, which provide the propulsive force. 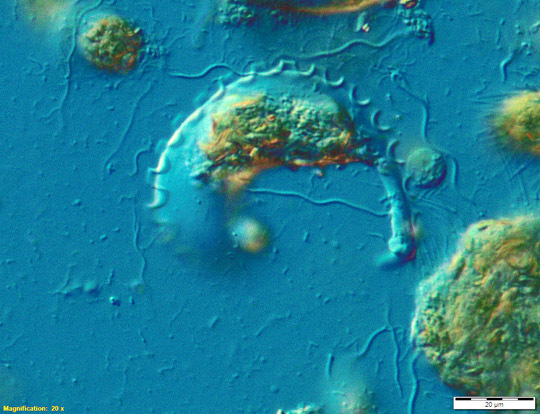 IMAGE 4: Pseudotrichonympha sp showing detail of the rostrum with flagella and the long prokaryote bacilli/spirochaetes which are attached at regularly spaced brackets on the surface. IMAGE 5: Details of prokaryote attachments sites on Pseudotrichonymphasurface. 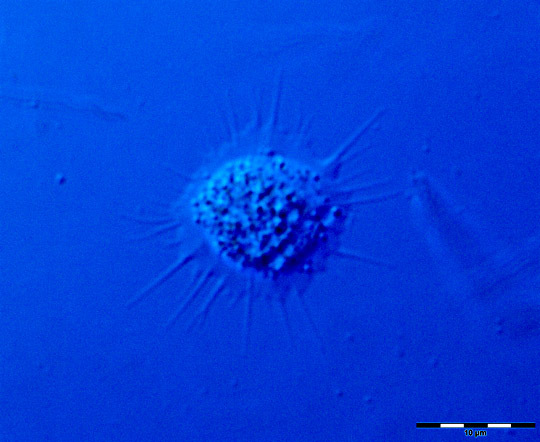 IMAGE 6: Pseudotrichonympha nucleus 100x Apo 1.4na. IMAGE 7: Pseudotrypanasoma sp, note the long undulating membrane and protruding axostyle. 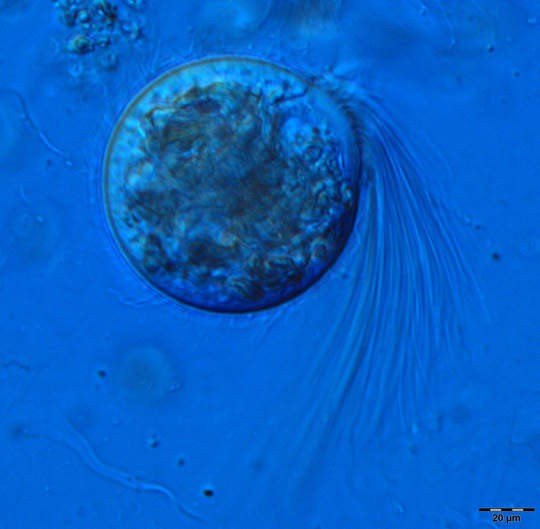 This unusual looking protist moves with a squirming motion, much like a nematode, it can be curled, straight (image) or in a tight circle. The undulating membrane is in constant motion, though does not appear to provide significant locomotion, it may be more of a fluid circulatory function. IMAGE 8: Pseudotrypanasoma giganteum – this specimen is extended with the undulating membrane on both dorsal and ventral surfaces. It may be a different species to that in image 7. They are quite numerous in the group 2 and less so in group 1 termites. IMAGE 9: Pseudotrypanasoma giganteum, another specimen from another group 2 termite; note undulating membranes are on ventral and dorsal anterior positions, the axostyle is prominent on the rear ventral body, this specimen like all others was very flexible and in constant curling and relaxation motion, see image 10. 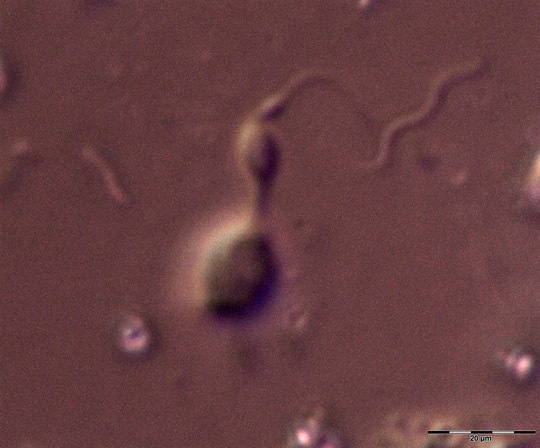 IMAGE 10: Curled Pseudotrypanosoma, the same specimen as in image 9, note the apical flagella indicated by yellow arrow. 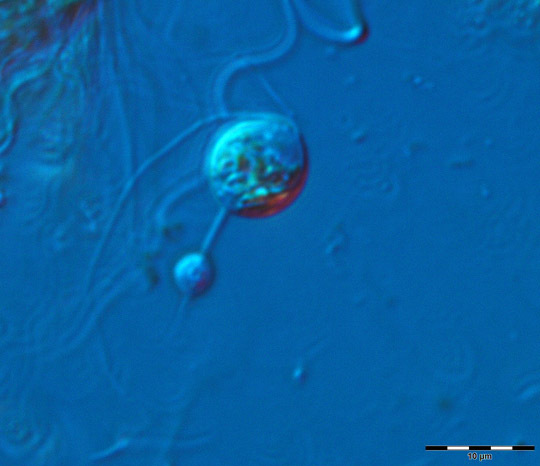 IMAGE 11: Trichomitopsis sp, – this is a smaller species with undulating membrane, it was observed to be not flexible with a rigid curved axostyle. 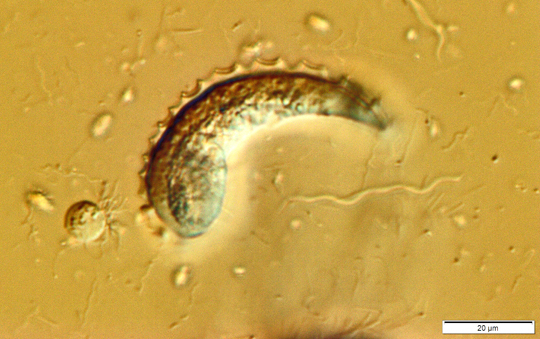 IMAGE 12: Unidentified rigid circular protist, one of a number in the same termite from site 1. Note the coiled motile costa and what appears to be an undulating membrane, however it was not seen to be in motion in several specimens. 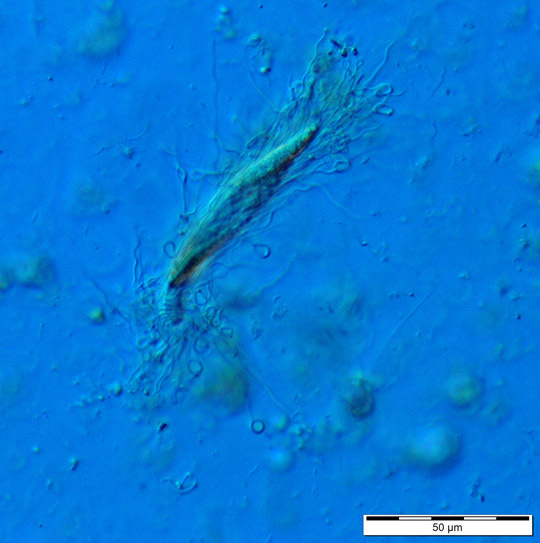 IMAGE 13: Joenia: note the long tuft of flagella on the ventral side, extended axostyle, ingested wood particles and attached bacteria. IMAGE 14: Joenia: note the axostyle is not present. 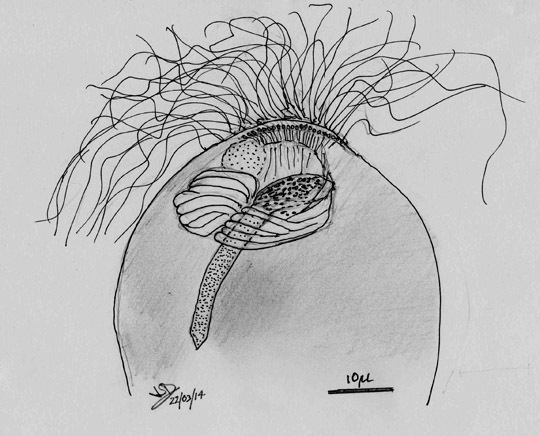 IMAGE 15: Line drawing of Joenia with axostyle internal, note the nucleus, parabasal body,and flagella attachment kenetodesmata. 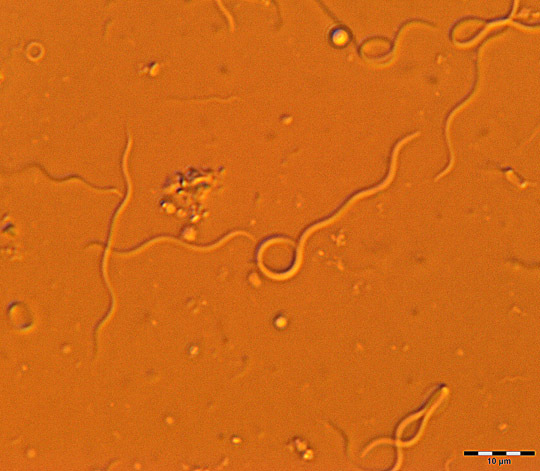 IMAGE 16: Holomastigiotes elongatum.Note the attached long spirochaetes often with coiled endings, a feature also found to be common to long spirochaetes not attached to protists. (images P1 and P2). IMAGE 17: Common large “long necked” protist in group 2 termites, they are agile and the neck is actively flexible. The author suggests they are a species of Pseudotrichonymphidae. Video data will be posted at a later date. 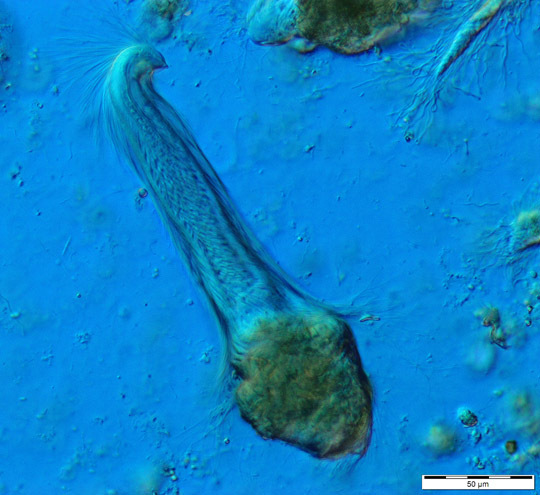 IMAGE 18: Unidentified protist; note the fan-like halo of rigid filaments. This is a not uncommon protist in group 2. 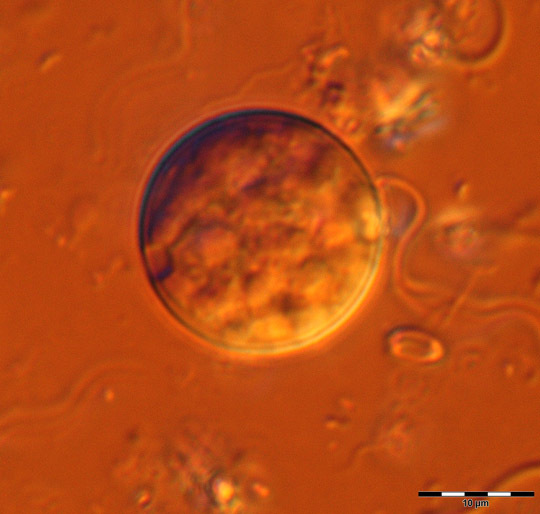 IMAGE 19: Spirotrichonymphid sp. – covered with attached prokaryote bacteria. 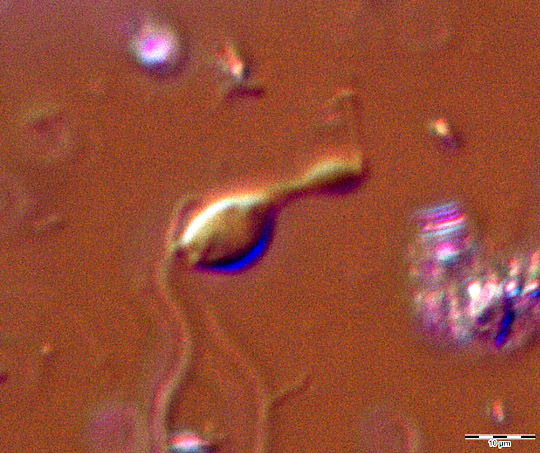 IMAGE 20: Small amoeboid protist presently unidentified, of the form of Mastigella sp, which is found in methogenic environments, however no flagella has been observed. It also has morphology likened to Vahlkampfia. These and other amoeboid forms have been observed in both termite groups, see image 18. 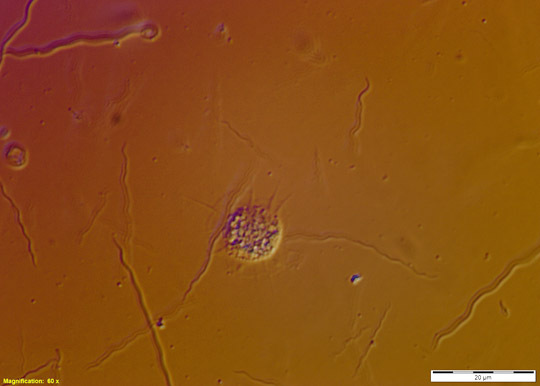 IMAGE 21: Detailed view of another similar small amoeboid protist, with filiose pseudopodia, granular cytoplasm, and flattened haloplasm. 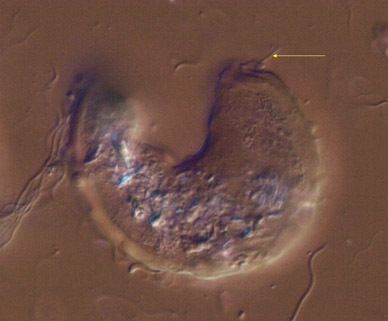 IMAGE 22: Possible cyst of an amoeboid protist, these are common in both groups 1 and 2. IMAGE P1: Field of spirochaetes common in both group 1 and 2 termites, however, soldiers termites had only prokaryote bacteria and no protists. 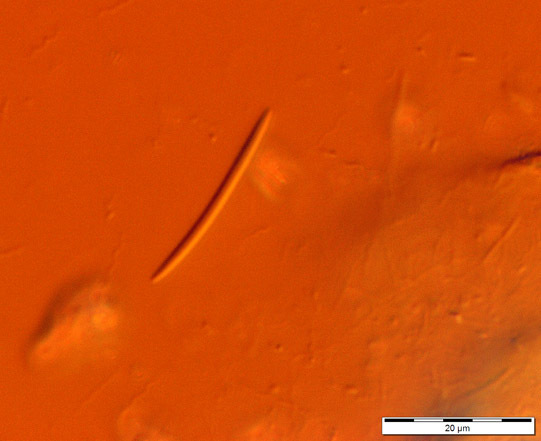 IMAGE P2: Spirochaete with a commonly coiled end, just what this behaviour implies is unknown to the author. IMAGE P2: Typical large spirillium, spirochaetes, treponema, bacilli and other prokaryotes. Note the completely coiled spirochaete left of centre. These coiled spirochaetes are common as well as spirochaetes with a coiled end (plates P1 & P2). IMAGE P3: Long fusiformis bacillus, also common and possibly Bacteroides termitidis. 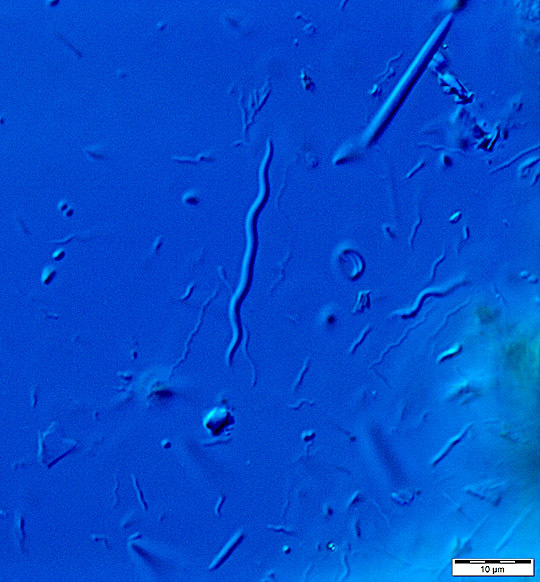 IMAGE P4: Long chained streptobacillus with spores. 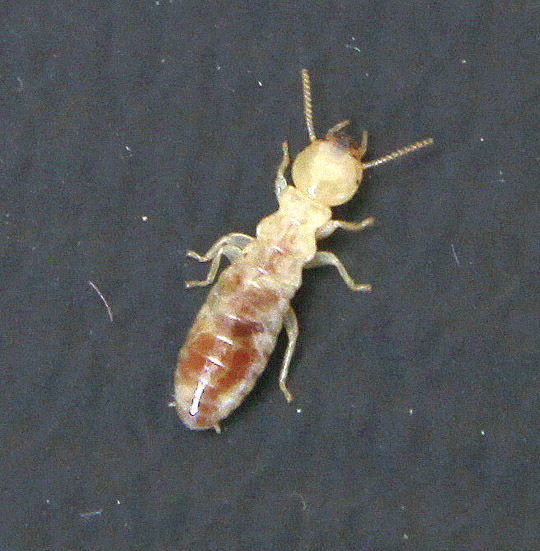 This type is found in both group 1 and 2 termites, however, appears more common in group 2. 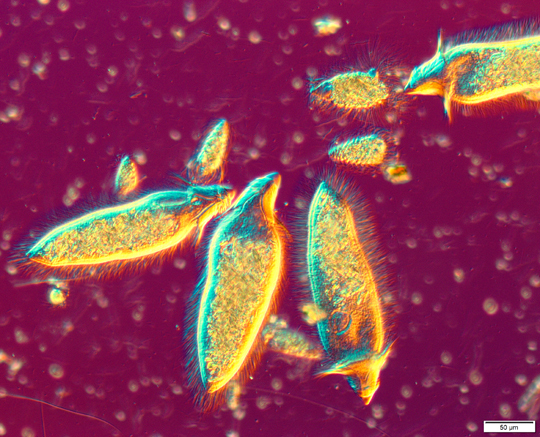 IMAGE P5: Large segmented so-called “rough” bacillus which have a typical multicellular structure. These types were only found in group 2 termites. The small spheres may be cocci. Possible relative of Oscillospira. 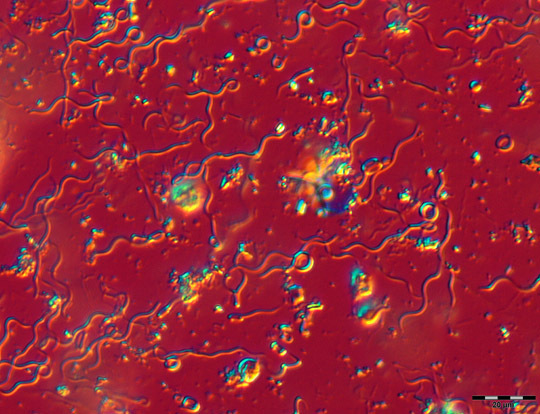 IMAGE P6: Large streptobacillus with attached spirochaetes, attachment by spirochaetes to large streptobacilli was common. Note the attachment points are small circular “boutons”. What the function of this phenomena is is unknown, perhaps a mutually beneficial symbiosis.